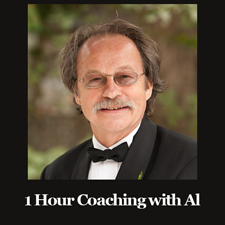 One hour of coaching with Al Link. By telephone in the United States and Canada. By Skype worldwide. Category: Coaching. Tags: advice, coach, coaching, counselling, guidance, marriage, relationships, telephone. Coaching is a very personal process and is uniquely different for each person we work with. Depending on your particular situation we will suggest things for you to think about, exercises for you to do, and activities to engage in on your own or with your partner.